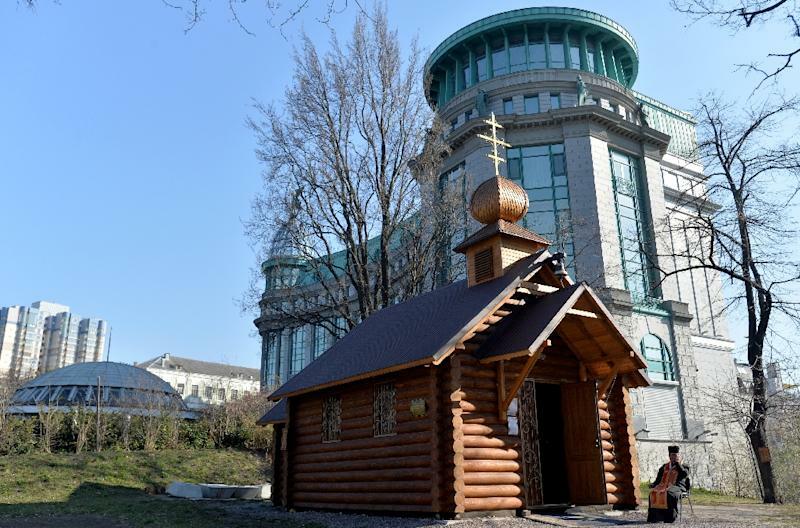 Kiev (AFP) - Confident and cheery in priestly black robes, 21-year-old seminarian Oleg is on duty in the small wooden chapel built a year ago above the Maidan, the scene of deadly protests in Kiev last year that shaped Ukraine's history. Bullet holes are still visible in nearby trees and even the windows of a tall four-star hotel, but nowhere is the memory of the repression of the protests as raw as in photos of the slain "Heavenly 100" that stare from makeshift memorials scattered around the vast central city square. 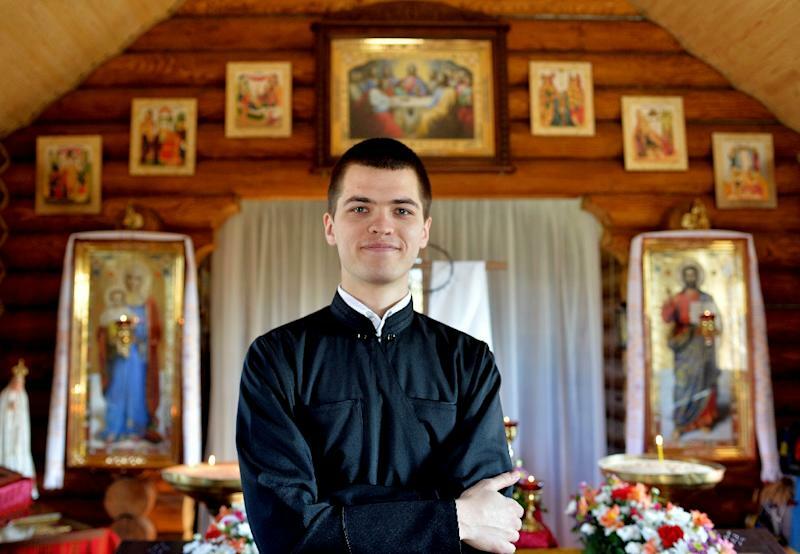 "We are here to talk and pray, we celebrate the memory of the young guys who died here, we help keep everything clean," says Oleg as incense fumes swirl in the one-roomed chapel. In the past months, city officials, relatives and citizens have been debating what to do about the tributes placed on the Maidan by family and friends of the around 100 people killed in the pro-EU protests against ousted president Viktor Yanukovych's corrupt rule. Leave them be or build a mammoth memorial? Or a museum? It took five years and a lot of talk before work even began on the 9/11 memorial in the United States. Another decade passed before it opened. The eclectic tributes to the people mowed down by gunfire in Kiev in February 2014, in the opening chapter of Ukraine's conflict, are at the mercy of the elements. In winter, they often carry a blanket of snow. But people keep the flowers neatly sorted in rows and the rosaries, candles and ribbons spruced up. Crude monuments with paving stones used in the Maidan barricades as pedestals for a display of the hard hats the protesters wore as protection and the rusty slabs of metal used as shields. The chapel has a gas mask on display that belonged to the first victim, a 20-year-old called Sergiy, as well as the blood-stained stole worn by the priest who was by his side. "People come here to remember, soldiers leaving for the front come for a blessing," says Oleg. But the Orthodox prayer house was erected above a key underground hub of power lines and switches, putting its future on shaky ground. "It shouldn't be there," said one member of the committee working on how best to maintain the memory of the Maidan revolt. "What if there were an emergency? It will have to go eventually." Tetyana, a financial manager from Poltava, a few hours away by train, stops at the Maidan to pay homage to the dead each time she visits Kiev because "we've never been as proud of our flag, our language" since the protests that brought down the pro-Kremlin Yanukovych. But "I really don't like how the Maidan looks now," she says, regretting the presence of the memorials, as well as the many men in uniform canvassing passers-by for donations to help the army fight a pro-Russian insurgency in the east. "These dried flowers and candles, you'd think it was a cemetery," she says. At Kiev's urban planning offices, members of the "Terra Dignitas" committee gathered on a chilly April evening for what turned out to be a feisty meeting about an international competition to build a memorial to the protest victims. A man in army uniform with a long, Cossack-style forelock and a woman widowed by the protests hijacked the discussion with loud complaints that city workmen had moved a handmade memorial to the woman's dead husband without informing the family. "This shows we need to get some order on this public space," said a committee member. 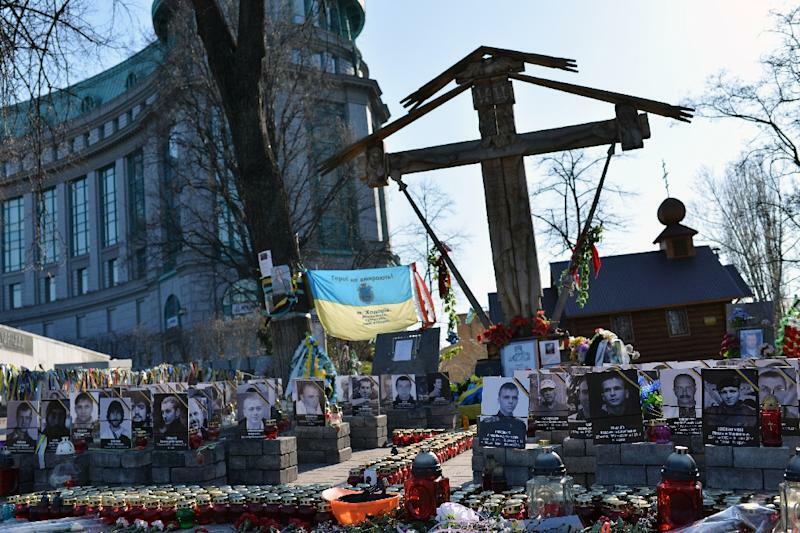 The initial aim of the memorial project, organised by Kiev city authorities and the Ukraine culture ministry was to find "the best artistic embodiment of the tragic events of winter 2013-2014 and to honour the memory of those who gave their lives." But after months of public debate, organisers instead are looking at cleaning up the square to create a space that reflects the spirit of the protests, rather than building a massive monument. The demonstrations began in November 2013 when Yanukovych scotched a political deal with the European Union, turning instead to Vladimir Putin's Russia. As the pro-West demonstrations gathered pace in the icy winter, drawing hundreds of thousands of people, there were concerts and prayers and poetry but also an open university, health centres, a lending library of 1,000 books, tents, heating facilities, free food and second-hand clothes. "It was like a huge common brain, a fantastic space filled with energy, and some of those activities continue today," said university lecturer Vladislava Osmak, who was elected with six others to steer the memorial project. "We need to turn the Maidan into a public space with fountains, benches, Wifi and playgrounds for future generations," she said. "Even the relatives believe the Heavenly 100 died not to have a monument but to leave a better life. So let's stop crying." "We can't leave these little monuments here, the city centre is like a graveyard," Osmak said. "We must make this place less traumatic, or people will never heal." After greening the Maidan, organisers plan a museum and a memory path to remember where each of the 100 died, "but not a Soviet-style monument" to anonymous heroes. But the main memory of Maidan cannot be a museum or monument, said historian Mikhailo Kalnytski. "It is now the success of Ukraine. The museum can come later."